There are many instances when we would like to join or merge a set of powerpoint presentations into a singe file, to do this you would have manually copy all the slides and create a new slide. Here is a quick and easy way to do this (Thanks Madhur) using a free software utility called Powerpoint Join. 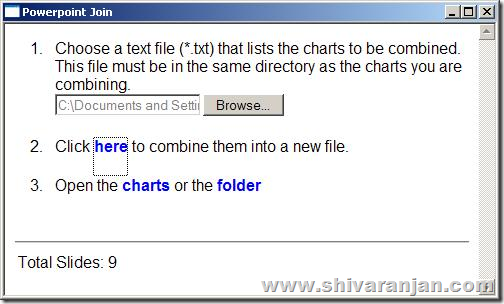 To join or merge multiple presentations copy all the presentations to the folder where the program is present and then create a text file with the list of powerpoint file names. Now when you run this utility all the files would get joined. The program requires no installation hence it can be run from portable drive, so if you happen to work with powerpoint files then carry this useful tool around. writing. I’ve had difficulty clearing my thoughts in getting my thoughts out there. I do take pleasure in writing however it just seems like the first 10 to 15 minutes are usually lost simply just trying to figure out how to begin. Any recommendations or hints? Many thanks!